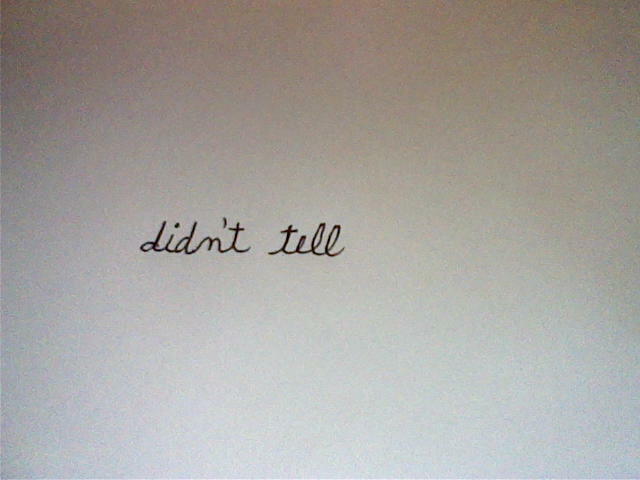 If you found this handwriting on the “Wall”….you would see ‘ persistence’ in the first ‘t’. We had talked about how this person will try,try again. 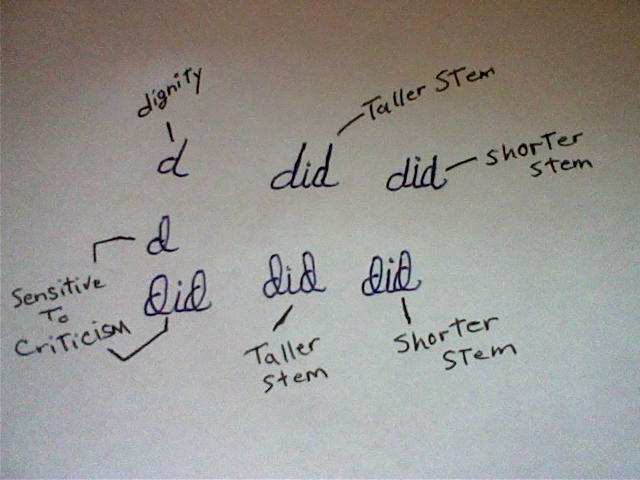 In the second word ‘dog’, you see a tall, and retraced ‘d’ stem. This indicates ‘pride’, and ‘ dignity’. This writer would take pride in his job, and stick to a conformed standard of living. He cares about his personal image! In the ‘g’, the long down stroke shows ‘determination’– he will finish what he has started–his idea has turned into action! Let’s look at the ‘t’ in ‘sits’ on the same line. The ‘t’ cross-bar shows enthusiasm,because of the long length,but also, it is tilted upward showing ‘optimism’–he will look on the good side of things, expecting the best possible outcome of a situation-he is hopeful. In the next line, it shows a ‘t’ cross-bar that joins with the ‘h’. This shows a writer with ‘fluidity of thought’. He is able to go from one thought or speech to another rapidly, or easily. 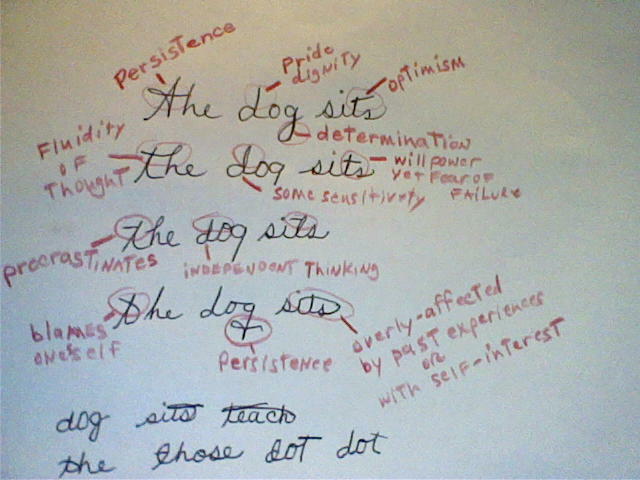 Next the ‘d’ in ‘dog’ has some sensitivity to criticism, because of the ‘loop’. I talked about this in my last blog. Also, the ‘t’ in ‘sits’ shows ‘willpower’ in the ‘t’ cross-bar,but it is a low bar near the ‘lowercase’ letters, so it shows ‘fear of failure’. Let’s look at the middle word in the fourth line. The word ‘dog’. 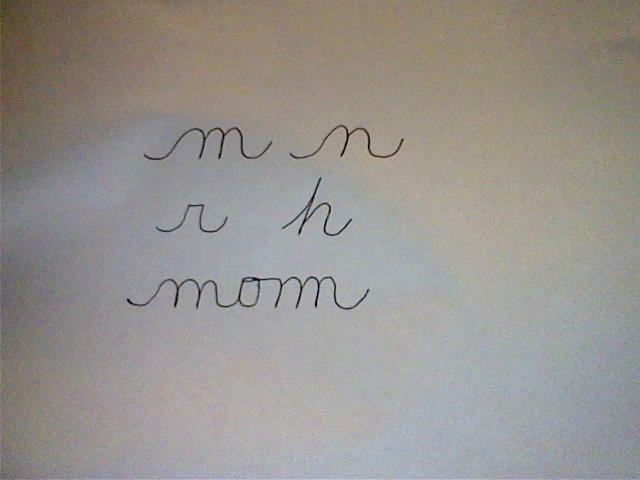 It has a ‘tie’ in the lower stroke, just like the one in the ‘t’ stroke. He is ‘persistent’ in action. 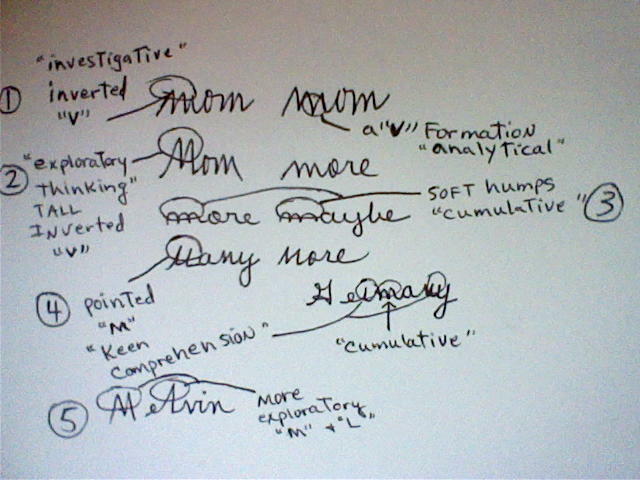 Here’s some examples to think about until my next blog, Do you recognize your ‘m’, ‘n’ and ‘r”s?? 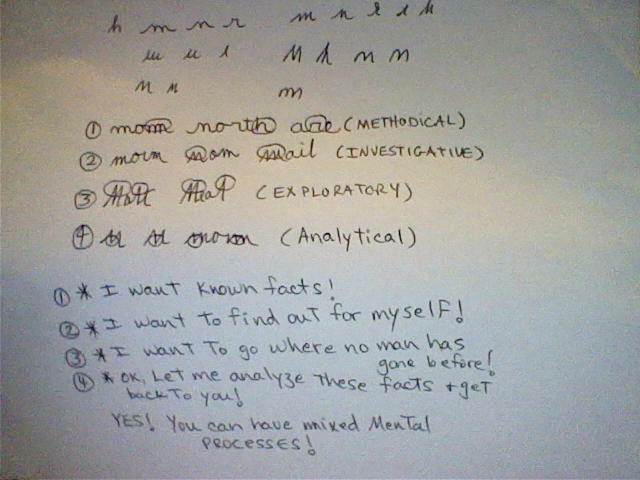 This will show us ‘the mental processes’ we use to come to a conclusion in our thinking. We will talk more about this in my next blog! Until then, remember to cross your ‘t’ higher, and reach for those goals! cool to be blessed! Let’s T-off with the ‘T’ Crossbar! You will notice we write our ‘t’ cross-bar in all kinds of ways. The top line shows a ‘t’ cross-bar that is at the top of the stem,and one is floating above. Then, there is a very low ‘t’ cross-bar, next, one that is a bit higher. 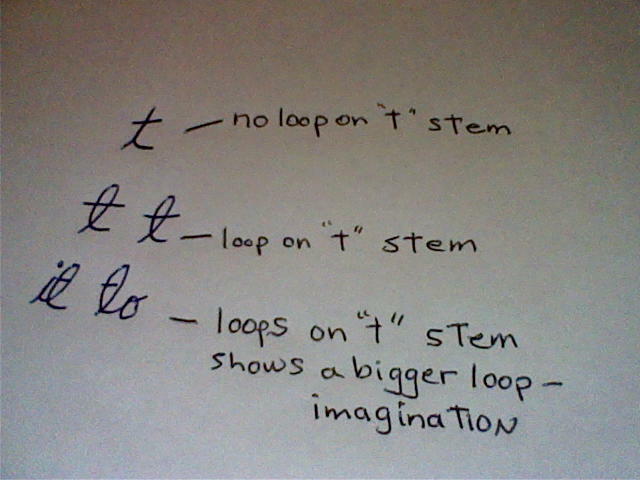 The last one is a convex (curving outward) ‘t’ cross-bar. In the next line we have a concave like ‘t’ cross-bar. Beside it, we see that the ‘t’ cross-bar joins with the letter ‘h’ Next, look at the slanted bar and also some with longer ‘t’ cross-bars. 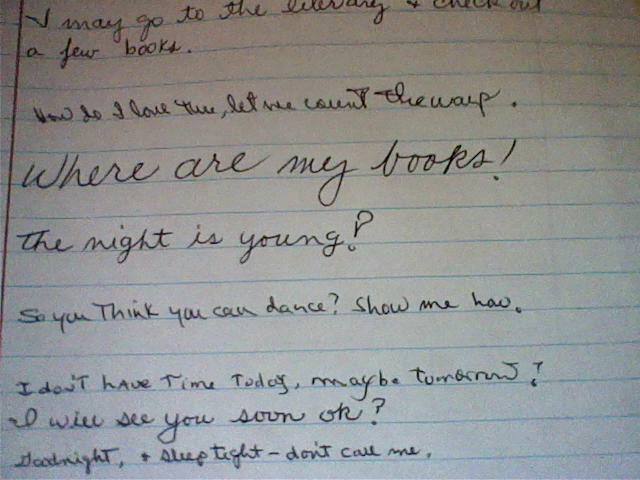 In the third line, it shows that the writer came up and crossed his ‘t’ toward the left side and stayed there,where as the next writer brought his ‘t’ cross-bar forward with a tie. Did you notice the next two ‘t’ cross-bars are incomplete? There is a ‘t’ cross-bar on the left side and one on the right. The last ‘t’ cross-bar is even further away. In the last row of ‘t’ cross-bars, notice how light, or dark the ‘t’ cross-bars are. We will talk more later about the difference in the there weight. Now, stop-think and look at your own ‘t”s,. 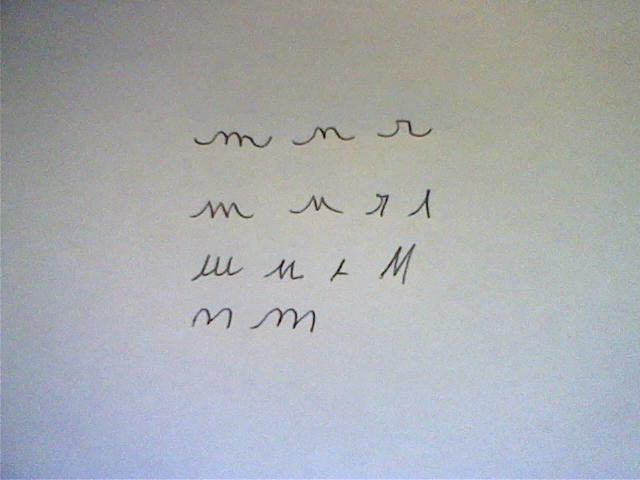 Do any of these look like your ‘t’ cross-bars? So,what do the differences all mean? We will find out, but first let’s address what the ‘t’ cross-bar represents. 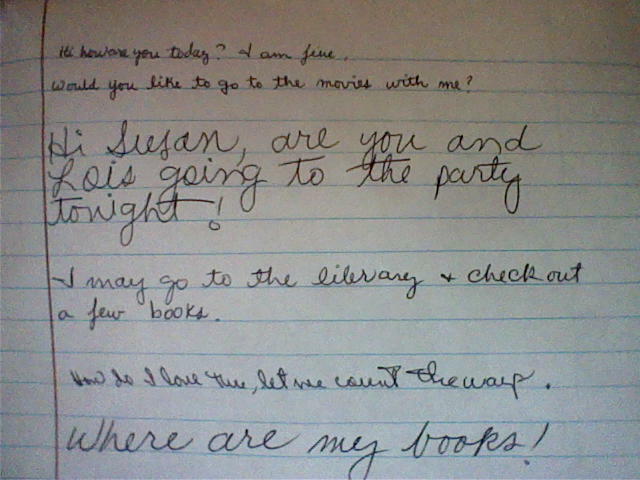 As you can see, there are ‘t’ cross-bars set at low to high practical goals ( in relation to the rest of the writing) These first two examples show a writer who wants to aim a little higher than everyday “go to the store’ goals. He knows he can do more and has the confidence to do it. The second set shows a writer who can aim for more challenging distant goals, with even more confidence in there abilities. The third set shows a writer whose ‘t’ cross-bar seems to be close to the tops of the small letters like ‘e’. This writer may just underestimate themselves, lacking the confidence they need to carry out there goals. The last ‘t’ cross-bar is very low. It is below the small letters (mundane area). This actually indicates self-abasement. They not only lack confidence,but also feel very low; humiliation, guilt,shame and inferiority. This keeps them from setting goals. 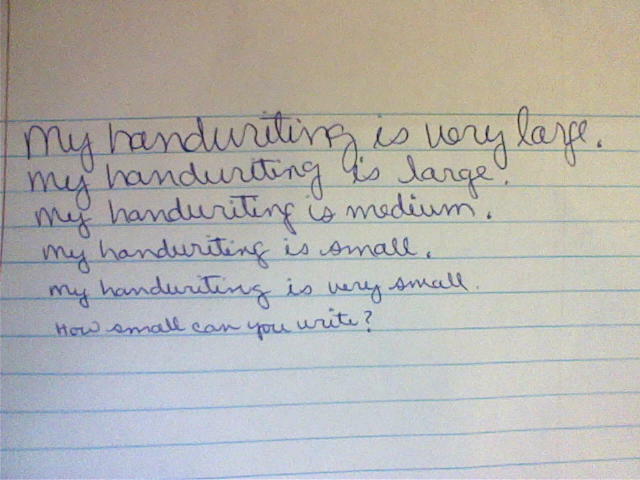 The first line shows a writer who writes ‘light’, and one who has ‘moderate’ weight and also shown is a ‘ heavy’ writer. We can see the ‘t’ cross-bar is written ‘light’ on all these. This indicates a weak will power, he may not be able to visualize clear goals for himself,not quite grasping an idea or goal. The second line shows moderate will power. The writer has a clearer picture of his goal in mind. 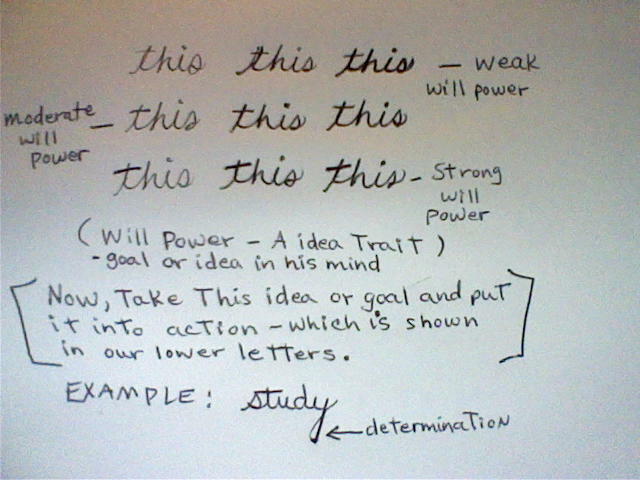 The third line shows strong will power; he wants it, and wills it! All these take place in the ‘mind’. 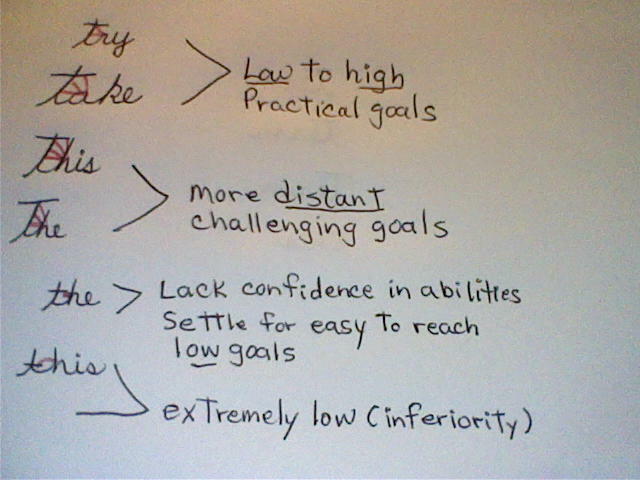 But, will these goals be put into action? Determination is needed to carry out their purpose. This is shown in the lower letters like our ‘y”s,’g”s, and ‘j”s. In our example above: the word ‘study’ shows a heavy ‘t’ cross-bar in relation to the rest of the word. Also, a heavy ‘y’ ending that shows ‘determination’. This is ‘the intent to finish a project –go into action–keep trying! 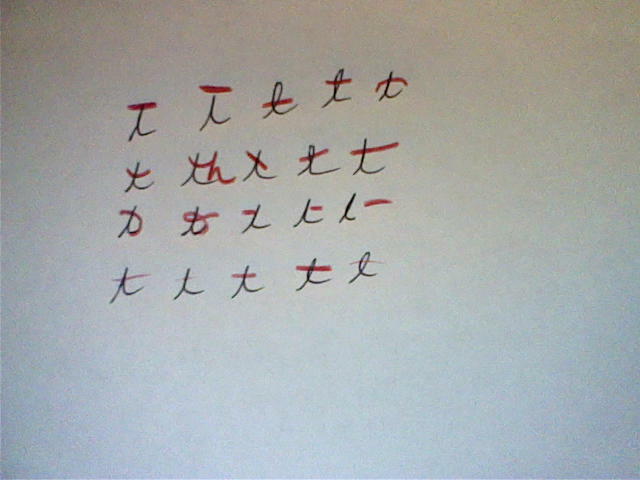 In the first example, this writer’s convex ‘t’ cross-bar shows he is exercising his will to control something. An impulse,emotion or desire. 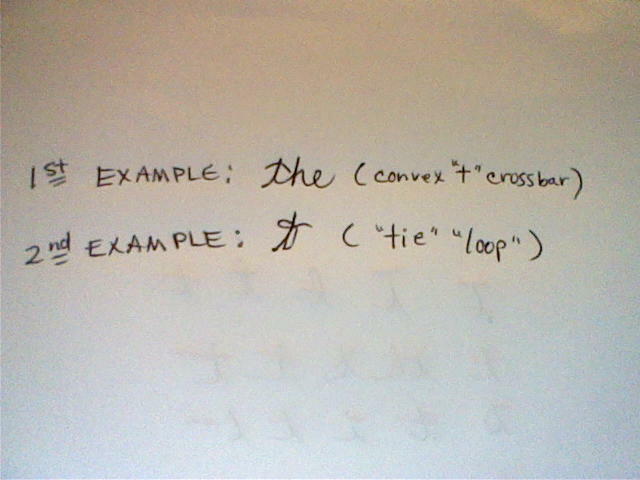 Our second example shows that the writer uses a ‘tie-loop’ with his ‘t’ cross-bar. This indicates ‘persistence’–he will try, try again. We will look at the others next time. If you have any questions about the others, now, let me know. I hope this info has not only been interesting, but helpful to you. Sorry it was so long. Take care and many blessings! !